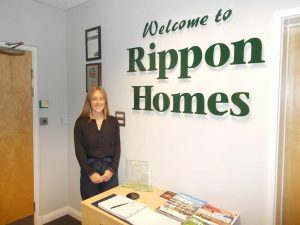 Mansfield based housebuilder Rippon Homes has appointed Georgia Higham, as Sales Administrator at its head office. The 21 year old from Skegby previously worked at an estate agent in Mansfield. With a strong interest in property, Georgia wished to stay within the industry but progress to a larger company to extend her knowledge within the housebuilding and selling arena. Georgia will spend her time liaising with surveyors regarding plot quotes, preparing handover booklets for each purchaser, dealing with reservations, early birds and more. Georgia said: “I am very excited to use the knowledge I have from my previous experience and put this towards my new role here at Rippon, and I am excited to work within such a great regional business.